To mark the first 12 months of IBISBA 1.0, partners met for the first annual meeting. 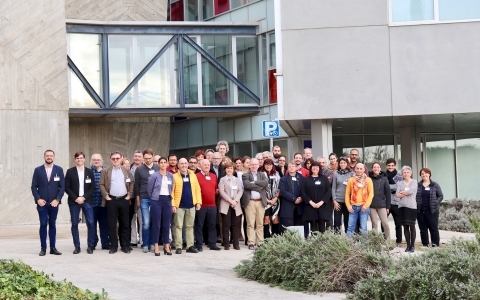 This 3-day meeting hosted by the Universitat Autònoma de Barcelona (UAB) was an ideal opportunity to take stock of things, looking at progress and recognising difficulties. During the first year, many goals have been achieved, with highlights being a first published study produced by the joint research activities and the launch of the first Transnational Access Call. Moreover, internal trainings have been organised. Regarding IBISBA's bespoke e-services, the IBISBAHub was launched. This data repository provides an inventory of project assets and, importantly, the means to make these FAIR (Findable, Accessible, Interoperable, Reusable). Assets such as SOPS, workflows, and workflow nodes are already present on the IBISBAHub (hub.ibisba.eu) and more things will be added as project participants become familiar with this tool. IBISBA 1.0 was presented at several international events, thus raising its profile as a new arrival in the European research infrastructure landscape. Following the inclusion of EU-IBISBA on the ESFRI roadmap and its presentation at the ICRI meeting in Vienna, publicising IBISBA 1.0 has become easier. Moreover, the higher profile associated with EU-IBISBA has provided the means to found new relations with the ELIXIR infrastructure and the CORBEL project.